“It has been said that we learn little from our most positive experiences; they only reinforce what we already know. It is our most painful and ‘negative’ experiences which provide the greatest positive value and contribute the most to our learning and personal growth.” p 88 Mark Haynes Daniell in Strategy for the Wealthy Family – Seven Principles to Assure Riches to Riches Across Generations. Although this part of this book is about how to let the super wealthy children have the same opportunities that are forced on most of us – to encounter and overcome difficulties, the sentiments apply to all of us. We all learn best from the pain we endure and overcome. What are the things in your past that haunt you? Was it the time you were able to save up and pay for something, or the time the re-possessor came around and took that car back? Was it the times you were flush with money or the times you were dirt poor and had to make do? For me, my best financial lesson came from suffering through 10 years of near poverty, the consequence of picking a non-lucrative college major, then figuring out how to re-train and enter a highly rewarding profession – learning to be independent and self-sufficient, even from my spouse. Read more on my story in my book. So, as ridiculously unwanted as they are, we should embrace our negative experiences and become better people because of them. What if early humankind had stayed in paradise? Warm weather, plentiful food to be had without working, few natural enemies and etc would have let us live in ease, but would we have grown? Would that first person have figured out how to tame fire? Surviving a negative experience and enduring through or perhaps even overcoming it shows us that we are made of more than we ever dreamed, that we can do and be more than we thought. But how can you learn to use those negative experiences, and teach your children to do so as well to benefit your financial health? The greatest increases in ability, knowledge and strength come from stepping beyond your current self. Set new financial goals for yourself. If you are coasting along, saving 10% of your income, up the ante to 15%. If you are rock steady on the path to paying down your debts, pay more. If you are confident and secure in your performance at work, take on something new. As a parent, your expectations of your growing child increase month by month and year by year. When he is a month old, you are overjoyed when he sleeps through the night. When he is a year old, you encourage him to take those first steps. When he is 16, you teach him to drive. Don’t stop challenging yourself after you are grown. Set new goals for yourself at each stage of life. You know that you are going to grow when things go wrong. 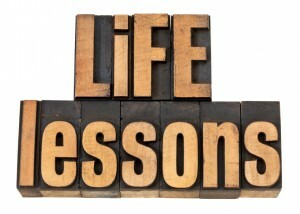 Consequences of your decisions and actions, once recognized, are the stepping stones to the better you, the richer you. When you were young, you didn’t know the consequences that occur when you leave your allowance laying around, until you want to spend it and can’t find it. Unless someone ‘rescues’ or ‘helps’ you by putting it in a safe place, you learn to keep track of your money. If someone always steps in after you to retrieve the money you left laying around (or takes care of it for you), you never learn. When you were a college student, you may have learned a painful lesson about credit. Credit card offerings to college students used to be ubiquitous. Free money! Party time! Perhaps you let the balance roll from month to month until it got so big you had to fess up to Mom and Dad before you learned to consequences of charging things. Perhaps you ended up paying ultra high interest rates and suffering through years of paying down debt before you learned to control and track your borrowing. But if Mom and Dad bailed you out when you fessed up, you probably learned a very different lesson, resulting in situations later in life (when Mom and Dad weren’t around any more) with much larger financial consequences. Don’t rush to bail out your kids, or do things for them. Let them try and fail while they are young and the financial ramifications are smaller. Don’t help your kid keep his allowance safe. Don’t bail your college student out of credit card debt. Do point out that their actions caused the situation and what could have been done to prevent it. Do teach them how to get out of their bad experience – to get back up again. Failure and negative experiences won’t necessarily or always have an end result of a positive. You have to figure out where you went wrong and try again. You have to realize that the bad consequence is a result of something you did wrong. If you keep losing your job, but blame it on the boss each time, you aren’t realizing the consequence of some action you took or failed to take. Perhaps you didn’t meet the performance expectations of the job. Perhaps you didn’t keep your ear to the ground to know that the company itself was having financial difficulty. Blaming your negative experience on someone or something else will never help you get back up again. You will keep stumbling and failing. Just as a child learns to roller skate by getting back up after each fall, you learn to handle your finances by learning from your negative experiences. Are you poor? We were. Did you blame someone else, or did you take a step back, look around and figure out how to become more financially secure? Did you figure out how to get back up again and stand proud financially? No one likes painful situations, but they can be useful. Next time you find yourself in one, embrace it and use it to leap forward… learn…grow…and enrich yourself. “The greatest increases in ability, knowledge and strength come from stepping beyond your current self. Set new financial goals for yourself. If you are coasting along, saving 10% of your income, up the ante to 15%. If you are rock steady on the path to paying down your debts, pay more.” It’s important to keep challenging ourselves our thoughts, physical ability and financial prowess. It is important to keep growing in non-financial areas as well. Eventually, if you keep at it, you will achieve financial stability, even freedom but if you aren’t growing your soul, your spirit and your humanity, money is for naught. True, sometimes negative experiences only appear negative from our current finite perspective. We might think pain and injury was negative if we didn’t realize the surgeon was removing a tumor. Ouch, true and true even of merely diagnostic procedures. The key is to learn from your mistakes so as not to repeat them..
I’ve definitely made my share. When you know better…you do better. Until then, you run the risk of repeating the same mistake. Agreed, we just have to remember to draw the lessons out and not dwell on the pain.